Fil-Am Idol JESSICA SANCHEZ is Back! A big voice in her own right, Jessica Sanchez is back to perform with an edgier look and a sound that is her own. Catch up with the powerhouse voice on November 10, 2018 in her self-entitled concert “Jessica Sanchez with special guest Martin Nievera” happening at The Theatre at Solaire. Jessica Sanchez’s story is one that begins when a shy 16-year old girl dominated the stage with a voice that can go head-to-head with some of history’s icons. It may seem like she was dealt a lucky card, but behind the curtains, it couldn’t be anywhere near the truth. 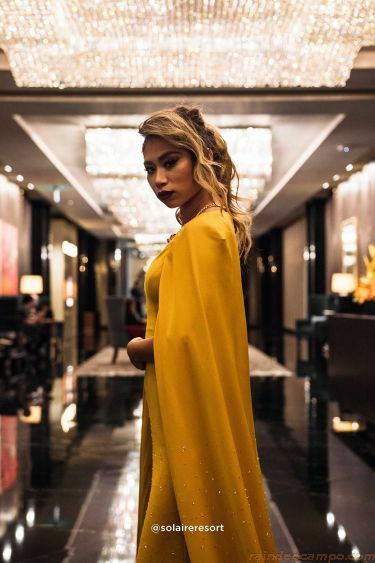 Born from immigrant parents who have established their lives in the United States and being in one of the world’s most watched singing competitions, one would hear many Filipinos say Jessica Sanchez was living the American dream. Some argued, however, that she was too American to be celebrated by Filipinos, adding the fact that she has never set foot in the Philippines prior her AI stint. But it was this opportunity that helped her touch base with a part of her identity that she has yet to fully discover. “My first time being in the Philippines was for the Idol tour. I was so excited for my first trip to my mom’s homeland. It all happened so fast, but I remember it being full of amazing food, amazing people and amazing moments.” Jessica recalls. Contrary to stated prejudices, Jessica is more Filipino than meets the eye. Just like other Filipinos who quest for greener pastures under the star-spangled flag, she also fell prey to the unforgiving eyes of those who saw her as an outsider, sticking out amid fair skin, corn-hued hair and colored sights. Despite the fragility that her youth has handed, her voice set her apart – a voice that commands and resists to be contained. And just as what her Pinoy compatriots do best, she persisted with an awakened innate resiliency – a Filipino quality that ultimately shaped her. She says that times have changed, and minds are more open, especially in the business of entertainment. Truly, Hollywood has seen an influx of Filipino heritage gracing its regal red carpets. Apl de Ap of the popular group Black Eyed Peas – someone who Jessica considers as a friend – is one that has made a dent in the once highly exclusive music industry, and has at the same time, continued to wave the three stars and the sun. Her upcoming concert will show her evolution and versatility as an artist with songs that are deemed as Filipino favorites such as “I Will Always Love You”, “And I Am Telling You I’m Not Going” and “I Have Nothing”, which are coincidentally, among her Idol performance repertoire. This night will also see a new Jessica that’s bolder and grittier as she sings R&B songs alike that speak of her edge and vibrancy. It has been seven years since her almost-victory. Bitter-sweet as it may sound, Jessica still feels blessed. “I am able to live my life doing what I love. I was given a platform on Idol when I was 16 and have accomplished things I’ve dreamed of, “ she says. Even with the dominant Western look and feel brought by the land that cradled her, she continues to beat blood in her veins that epitomizes what the Filipino talent can reach and the kind of stage that it deserves. For tickets to “Jessica Sanchez with Special Guest Martin Nievera” Concert, call TicketWorld at 891-9999.